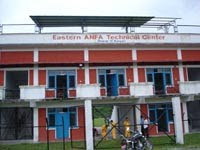 When I was out East, I had a chance to visit the Eastern ANFA Technical Center in Dharan. While the construction of the Technical Center had major hiccups and rightfully came under severe criticism for its poorly accessible location and shoddy design, the management team in Sunsari have done a solid job of reworking a structure that was destined to be white elephant. The location of the facility is absolutely gorgeous - it is in a virgin area, right below lush green hills. It now has a beautiful full-sized field and boasts canteen and rooms for the 24 academy boys who are training there. There is a stand on the east side that can seat around 5 - 8,000 spectators. The facility could potentially be a great preseason training destination for football clubs from Kathmandu, Northeast India and West Bengal which are all a night-bus / night-train ride away from Dharan.